Diversify your wardrobe and Mix and Match; the Gibson way. Breathe new life into your wardrobe, crafting new looks that are creative, stylish and versatile with Gibson London’s guide to mixing and matching. Mixing and matching is the ideal way to spice up your wardrobe for a true, dapper gentleman's look. Gibson London isn’t just three piece suits – every item in our colourful range is available individually; designed with mix and matching in mind to make a statement. Gibson is the suit for the individual gentleman, and with mixing and matching you can create a tailored look that’s distinguished. Through the Savile Row tailor’s style and our range of colour palettes, Mixer suits are a speciality. A wedding or formal occasion is the perfect platform for mixing and matching. 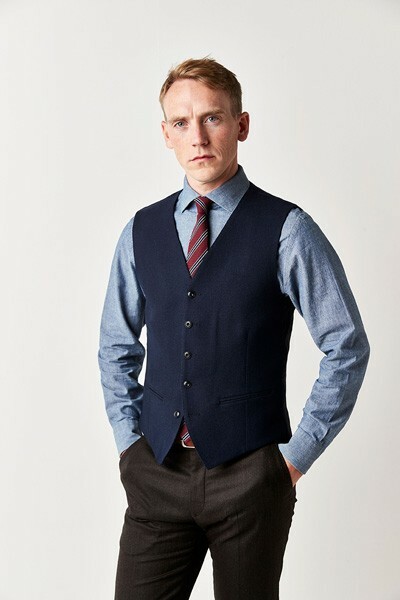 Create a classic look – add Gibson London’s Navy Textured waistcoat to our Coffee Herringbone Trousers, with contrasting, dark brown shoes. The contemporary look - layer our Navy Blue Check jacket and trouser over a white shirt and our bestselling Grey Linen Blend Waistcoat. Wool rich, with our signature lining – ideal to make a statement. Finish with a navy tie and classic dress shoes in either brown or black. Mixing and matching for the office can work for any dress code, and helps maintain an individuality and eyecatching style to even the most colourless commute. Once again, navy, grey and white combinations rule here. Gibson London’s Blue and Brown Check Jacket in grey features a subtle green check and Matches effortlessly with a white shirt. Try the round-collar White Penny shirt, and add a colourful twist with blue striped trousers. Formal dress code? Add a tie – plain or striped - and complete the look with navy or black Trousers. Brown shoes offer the finishing touch. The race day suit has to be fit for royalty – practically built for Gibson London’s quality and style. For an event like this, variety is the spice of life! The Gibson London Green and Burgundy Check Jacket features a grouse style jacket with our signature map-printed lining, and our iconic compass pin. Add to our Coffee Herringbone trousers, with a pair of brogues. Classic fashion; with a novel twist on the vintage style. 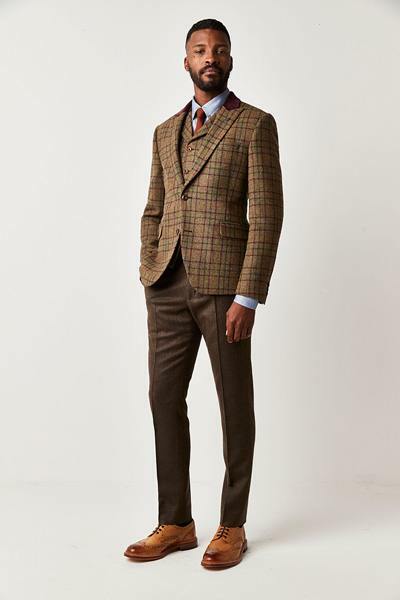 For a cleaner look, consider Gibson London’s Green Brown Herringbone Suit Jacket – with a two-colour forest palette that adds country style to your outfit. 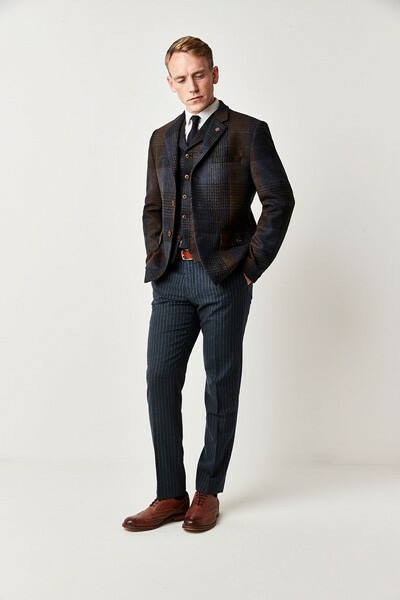 Add our matching trousers, then break it up with our Tartan Check Waistcoat in teal and navy, for a colourful flair. Add brogues or wing-tips for the final statement. 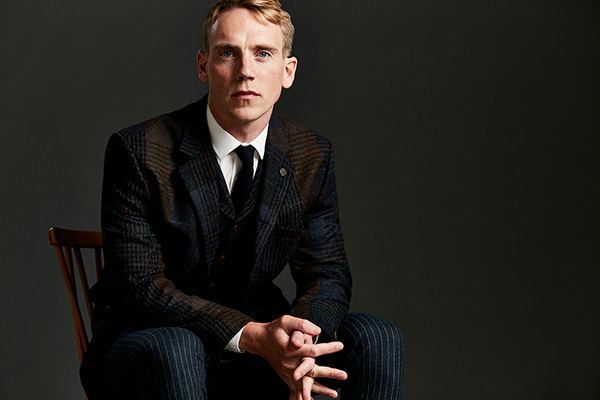 Gibson London – Practical Suits, with Character. Built for Mix and Match.